"Harun and I didn’t know what to expect initially but we had a better idea and gained more knowledge as the lessons progressed. Though Nadine is soft spoken with her effortless sense of style, she is firm and feisty. You can clearly see that she’s very passionate when giving out advice to her students i.e., to take charge by making informed decisions and sharing her valuable experiences dealing with mothers in labour. Knowledge and information shared during the sessions have made a significant impact on how we view birthing. She had given us the confidence we needed to prepare ourselves for the big day and made us feel as though giving birth was that simple! Every session was engaging, interactive and informative. We certainly had made the right decision by signing up for the classes and we highly recommend this to other couples. Worth every ringgit spent!" "I was determined to have water birth and I couldn't have done it without the support of my partner and Nadine as my Doula. This was our first pregnancy and we both wanted to have an experienced and encouraging coach to help us along the way. In addition, I wanted to complete childbirth naturally with no medication. My partner and I felt very comfortable with Nadine from the first time we met her - she's very friendly and motherly but also very motivating which is very comforting when you're in a lot of pain! Nadine was helpful in educating us in what to expect in the weeks leading up to the birth, the childbirth process itself, and what to expect postpartum during the HypnoBirthing class. Nadine was very professional and nurturing throughout the labor and delivery. In addition to her active coaching, Nadine brought extra pillow, blanket, warm pad, essential oil and massage she give me really helped with my surges. I also found it so important that I did not have to be left alone at any point during the labor (Nadine was there when my partner needed a quick rest). I highly recommend Nadine because she is extremely knowledgeable, professional, patient, and kind and she was a tremendous help to my partner and me. She is a great support to have during the most important thing a women has to go through. Looking back, my partner and I were very happy about our birth experience and we are so thankful to Nadine for being a part of it. 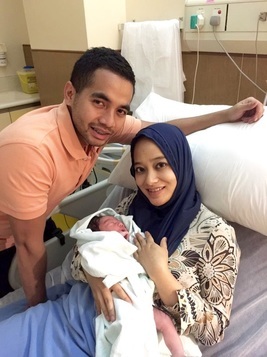 Our son, Ethan, was born at the Pantai Kuala Lumpur Hospital." "Using Hypnobirthing techniques resulted in a gentle, positive and empowering birth experience for me and my baby. Wouldn’t have it any other way! HappyHypno Mama = HappyHypno Baby"
​Joined hypnobirthing classes because it was highly recommended by a friend, so I didn't have any expectations as I had no idea what it was about. 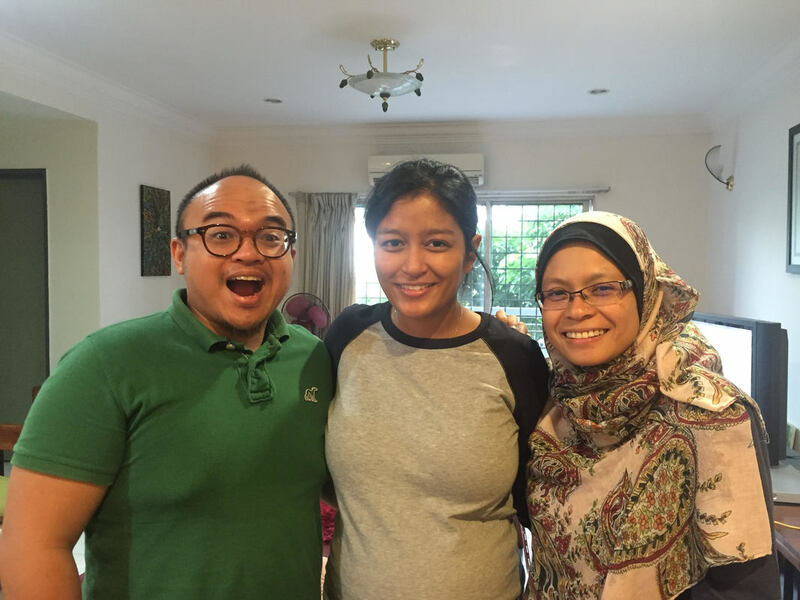 I've always been terrified at the idea of giving birth, but after going for the first class, my husband and I already thought of the idea of giving birth at home. That's how powerful it is, and of course the impact was made even stronger by Nadine. I never knew that it was even possible to give birth gently, but everything I learned in the classes was so mind-blowing. From being scared to give birth, after classes with Nadine, I honestly just couldn't wait for the day I was going to birth my baby out from me. Also loved that there were only 3 or 4 other couples in class, so the sessions were very intimate and we were all very comfortable sharing our thoughts with each other. Now all of my hypnobirthing classmates have graduated by giving birth and we are still keeping in touch and sharing things about our babies. As a first time mom, I had no idea what to expect of pregnancy and delivery. Some friends took it too casually, and some exaggerated their own birth stories. As it always was with me, when in doubt I looked for knowledge. The classes with Nadine gave me a clear perspective on what to expect, and ways to make sure I was able to put my stress, fear and negativity away and instead relax and focus on my birth. To tell you the truth I have always been scared of medical setting, and interventions, and the only way I survived my emergency C-Section was because of my Hypnobirthing classes. I knew all the decisions the doctor was making was the best for me and my baby as I was informed what to expect during the birth process and its possible complications during my meet up with Nadine. I utilized the relaxation techniques I learnt throughout the operation. It is amazing how little pain you feel when you are relaxed. Even my ObGyn was surprised at how relaxed I was at the operation theater and during epidural! Even though I did not have a natural birth, I can say I had a successful hypnobirth as I was informed, relaxed and happy throughout the process. Thanks Nadine for the valuable lessons! ​To summarise in a few words - Excellent and highly recommended. And that too not only for the mother to be but the biggest advantage will be for the fathers. I would like to share my experiences honestly and in very simple words as my experience with Nadine was not only a class but a very personal one which I will appreciate for the rest of my life. I have always feared childbirth. The factors are possibly lack of knowledge, education and not knowing that the actual fact of it being a natural process both me and my husband can enjoy and look forward to. The HypnoBirthing classes coupled with Nadine’s kind and gentle nature helped us to understand that and prepare us for what was to come. The only wish I had was that I started earlier to be more informed and more prepared as that’s all I needed. The Hypnobirthing and breastfeeding classes was enough when compared to reading the books and watching youtubes online which all seemed very contradicting and an overload of information for me. In addition, the classes brought me and my husband closer, in understanding the process of having a child and the things to do right and made us stronger in making our decisions and what’s best for our new family. At this point I must add that my husband actually mentioned he was in awe of Nadine and her knowledge and ability to share such good things with the society and make a career out of it. Her passion and love for making a change and helping mothers like me through this process was unmeasurable. 6. Offline support – Nadine made the special effort to give me advice on other things outside of the scope which saved me a lot of medical grievances. She even spent extra time with me, and is a constant motivation to do keep trying and practise various methods to improve the health of baby and me. 7. Power to make our decisions – everyone should be equipped with knowledge to make the decisions best for them and babies. Yes no doubts doctors can advise you but I truly believe you should have options and have the ability to explore options with doctors. The classes gave us that power and I am so glad I explored all my options and knowing as a mother I did my best. The most important thing was I am now in control of my choices, health and baby’s delivery and for me that is the most powerful thing Nadine thought me. Anxiety levels are out the window and excitement in.